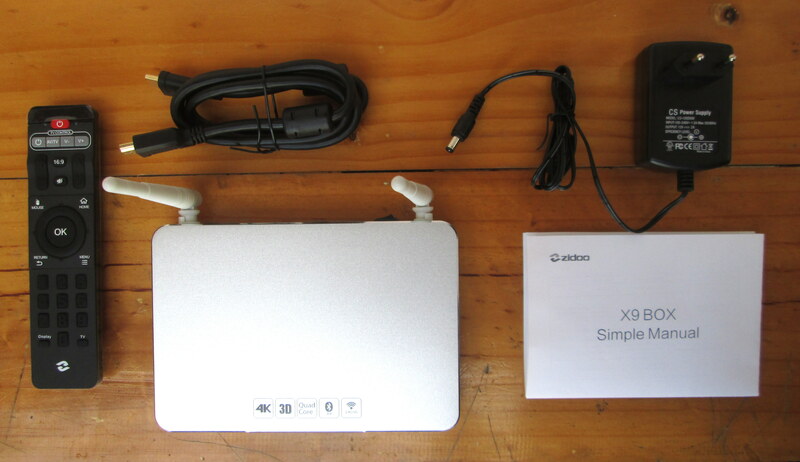 Zidoo X9 Android media player is powered by Mstar MSO9180 quad core Cortex A9 processor, supports 4K video output and decoding, H.265 codec, a USB 3.0 port for (hopefully) fast external storage, and in HDMI input port that allows you to record video from another HDMI input device to a USB mass storage device, or micro SD card. GearBest sent me one of the first sample, so let’s have a look at the device itself, and its boards, because getting to the full review next week. I received the parcel the exact same day, GearBest provided the tracking number, together with some invoice for custom duty, DHL duty handling fee, and VAT. 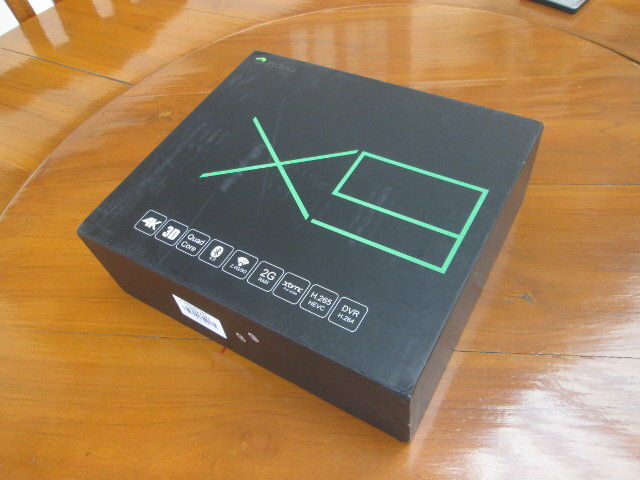 The large black package has a few scratches, and makes it clear the device is called X9. Some of the main features are also mentioned on the package: 4K, 3D video, quad core, Bluetooth 4.0, 2GB RAM, dual band Wi-Fi, XBMC, H.265 codec support, and H.264 video recording (DVR). The box comes with a nice IR remote control requiring two AAA batteries (not included), an HDMI cable, a 12V/2A power supply which should provide plenty enough of power for an external USB 3.0 hard drive, and “X9 BOX Simple Manual” showing how to connect the box, and troubleshoot potential issues. Checking out the device itself reveals two Wi-Fi / Bluetooth antennas, a front panel display, as well as two USB 2.0 host port, a USB 3.0 port,and a micro SD card slot on the side. 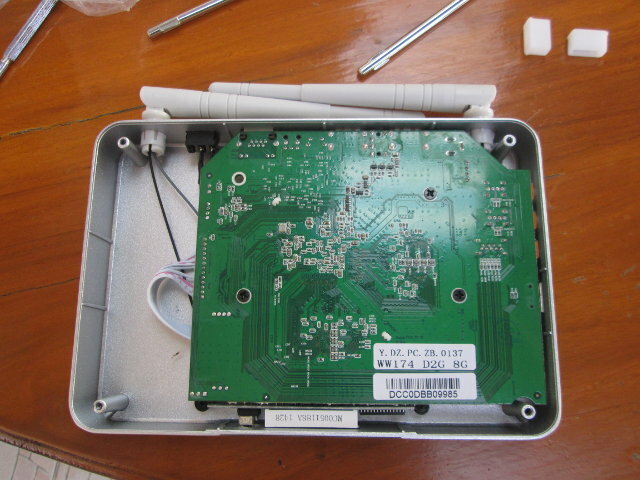 The rear panel has most of the ports: On/Off mechanical switch, a Fast Ethernet port, optical S/PDIF, a reset pinhole for firmware recovery, HDMI input, AV output, HDMI output, and the power jack. The top part of the enclosure is made of plastic, but the bottom cover is made of aluminum. Remove forums screws on the bottom of the case, and gently tap on the top to take out the metallic cover from the plastic case. There’s not that much to see on that side of the board, except the MAC Address starts with DC:C0:DB which confirms Shenzhen Kaiboer Technology (Kaiboer) made the board, and Zidoo team focused on the software side of the product. We’ve got to remove three more screws, and disconnect a few cables to have a better look at the board. There’s a largish heatsink covering Mstar processor and two RAM chips. 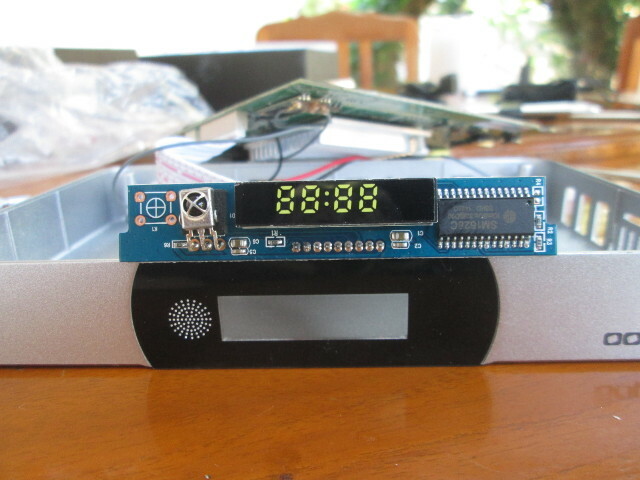 The top left header is for the On/Off switch, the small 3-pin header on the right most probably for the serial console, and the larger header is for the front panel display. 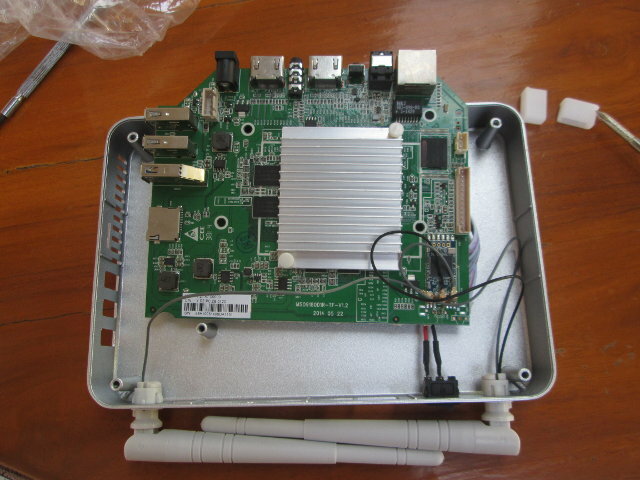 The board name is MSO9810D1R-TF-V1.2 made on May 22, 2014. We can also see three cable coming out of the wireless module to the two antenna. Most probably one wire for Bluetooth, one for 2.4GHz Wi-Fi, and one for 5.0 GHz Wi-Fi. 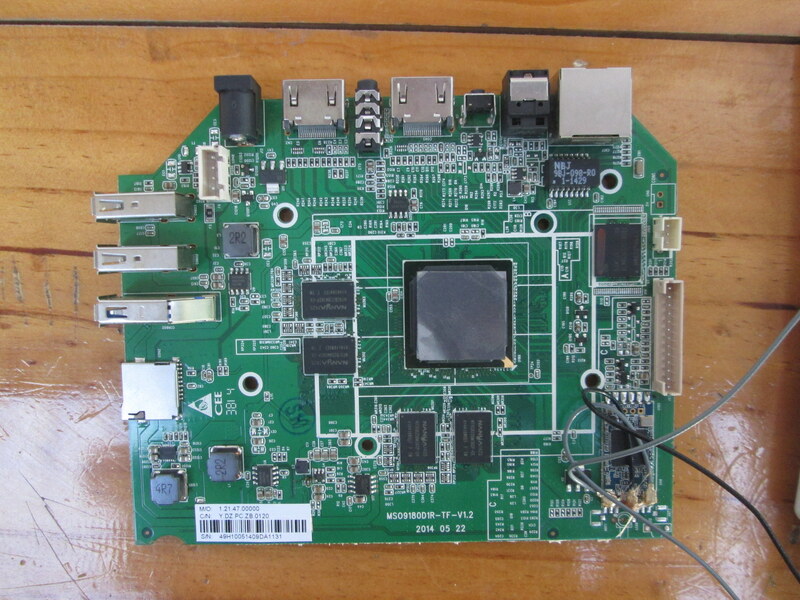 I’ve also removed the heatsink to have a better look at the board. A thermal pad is sticked on top of MSO9810D1R SoC and does not seem to come off easily so I left it that way. Four NANYA NT5CB256M16CP-EK DRAM chips are used to get 2GB RAM, and a Samsung KLM8G1GEAC-B001 eMMC flash provides 8GB storage. The latter should is an eMMC 4.5 Class 700 eMMC which should provide pretty good performance compared to some cheaper Samsung eMMC used in other devices, something that I’ll hopefully be able to confirm with benchmarks. Most products on the market comes with Broadcom based AP6xxx modules, so it’s nice to get a change for once with a wireless module based on Mediatek MT7632UN chip, which on some modules support 802.11ac, but Zidoo only advertises 802.11b/g/n Wi-Fi support. I’ve also taken out the front panel board (MSTAR_VFD_1.1) for those interested. That’s all for now. I’d like to thanks GearBest for sending a sample of this interesting product. They sell it for $144.99 including shipping with coupon ZDX9CN. It’s also available for about $170 on Amazon US and Ebay.